Well, so much for National Peanut Butter Lover’s Day. I dropped the ball and made a batch of chocolate chip cookies using half a box of pudding mix. The recipe is based on one called Award Winning Chocolate Chip Pudding Cookies. They’re okay, but I don’t love the artificial vanilla flavor (as opposed to how I did love it in the sugar cookies) and the texture is moist, but not crispy/chewy enough. Back when I first tried the recipe years ago using the original from allrecipes.com, I thought it was award-worthy. But tastes change. I like the cookies, but they’re not my favorite and I probably wouldn’t give them a ribbon. Maybe I should try adding peanut butter? Sift together flour, salt, and baking soda in a bowl and set aside. Cream butter and both sugars in the bowl of a stand mixer fitted with the paddle attachment on medium speed until light and fluffy, about two minutes.Pour in instant pudding and mix until completely combined, about a minute. Add in egg and vanilla and beat for about 30 seconds. Gradually add flour mixture and mix until just combined. Fold in chocolate chips. Drop by rounded tablespoonfuls on a parchment-lined baking sheet and bake for 12-15 minutes, or until edges are golden. Let cool on sheets for about two minutes, transfer to cooling rack to cool completely. If you want to make a ton of cookies, the original version is on allrecipes.com. Anna, I actually used Trader Joe’s vanilla pudding mix. That stuff is yum. And I just made the cookies on Wed, and have been way busy lately, so I’m gonna try to post mine real soon! I’ll let you know! I’ve been browsing all of your cookie recipes for a cookie contest I’m entering this weekend at my church. I’ve been trying to decide between making an exceptional chocolate chip, or something unique. Now I’m having an even more difficult time deciding. I also came across this recipe http://jensyummyfun.blogspot.com/2010/02/yukas-richest-ever-chocolate-chip.html that I think looks really interesting. Just wondering…do you think it would make any difference in the final product (either in the sugar cookies or chocolate chip) if you used a pudding mix that needs to be cooked as opposed to instant? I’m thinking that the “to be cooked” kind might not leave as much of an aftertaste than the instant does. Your feelings about them sum up my feelings about them. I totally agree with you on the artificial flavor pudding tends to give, and like you my tastes have changed as well!! I make these cookies a lot, and I love them! I usually use chocolate pudding though, with a whole bag of semi-sweet chocolate chunks and half a bag of white chocolate chips. I find them really easy to make, and they bake up pretty thick and soft. Perhaps the solution is to freeze them as Chipwiches–you could put peanut butter swirl ice cream between some of them for the holiday! yeah, they were almost waaay too cakey when I first took them out of the oven. About a day later they were perfect, texture-wise. I tried it with chocolate pudding and mini M&Ms last week, they were really pretty good. I think they just need a little time to sit. I’m trying one 5 hours later and they seem denser and more satisfying. I can see why they are popular. There is never any pudding mix, instant or otherwise, in this house so I wouldn’t think to try the cookie recipes. I’ll stick with the real thing. I too tried the allrecipes.com version a while back. It got such great reviews on the site I figured they would be outstanding. I didn’t care for them. It was more of a texture thing rather than taste. They seemed to taste too “cakey” for my liking. I use a full box (the 4 serving size) of chocolate pudding mix- and not the sugar free kind. I use a cup of mini choc chips with a handful of white choc chips. No complaints from anyone about these! I used to swear by Chocolate Chip Pudding Cookies for a while. Everyone I made them for loved how long they stay soft for. However, they’re a bit cakey for me, and I prefer a different texture. 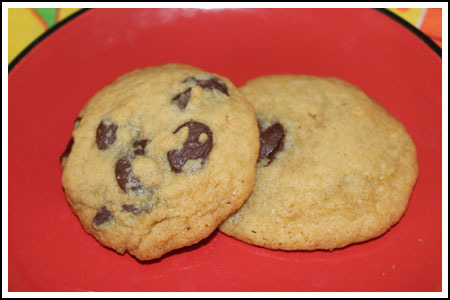 My favorite cookie of all time is one I found via your website, the Cook’s Illustrated Perfect Chocolate Chip Cookies. Love those! The nice thing about pudding cookies is you can use various flavors and chips.